Natural Slate Tile is the Ideal Flooring Material - PetraSlate Tile & Stone is a wholesale supplier of quality flooring products from around the world. Visit us online to view our products Gallery. Slate offers a beautiful and natural option for any interior floor space. Real slate tiles are laced with natural hues and textures and convey an aura of drama and elegance to any room or hallway. Often preferred for kitchen and bathroom floors, slate tiles are naturally rugged enough to handle years of heavy traffic and use. Stone flooring has become the preferred element of many custom luxury homes. Homeowners and Designers are specifying slate because of its unmatched beauty, style, and easy maintenance. How is Natural Slate Formed? Let’s face it. There is nothing better than using the real thing in a quality home. While manufactured products that intend to simulate genuine stone are plentiful, their appearance, durability, and texture fall short compared to Nature’s own handiwork. Slate is a product of centuries of metamorphosis, beginning as a mud-like material made up of silt, clay, and organic materials. Centuries passed, and the effects of high pressure and extreme heat from tectonic collisions of the earth’s layers caused the rock to evolve into a dense, non-porous and robust material that we know as slate. Natural slate is commonly gray, although black, purple, brown, tan, and even shades of red can occur. Variations in color depend on the environment in which the slate was formed, the types of organic materials included during the early creation, and the presence of oxidation during the stone’s formation. Natural texture is one of the outstanding features of slate tile. Many suppliers choose to split, rather than saw the slate to preserve a slightly uneven surface of the tile. The unevenness creates a natural cleft or roughness that forms a more slip-proof surface. Natural slate tile retains heat, making it ideal for bathroom floors in colder climates. 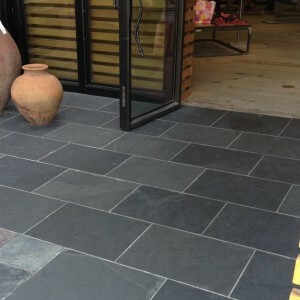 Slate tile is easy to clean and maintain. However, an occasional sealant application to preserve the original look is recommended. For information regarding natural slate tile for your home flooring, contact the professionals at PetraSlate Stone &Tile. The company is Denver’s leader in the sales and installation of premium slate material for floors, roofs, and exterior hardscapes. To view their Gallery of high-quality natural slate tile and more, visit the PetraSlate Stone & Tile website at https://petraslate.com/. For information, call the experts at +1-303-280-9595.